The Lhasa Apso originated in Tibet, where documentation on the breed exists from as far back as 800 B.C. They were, and still are, valued as a companion and watchdog. Originally, the dogs were kept as good luck talismans and were never sold but given away as gifts to those who the lamas held in high esteem. The Lhasa Apso was recognized by the United Kennel Club in 1975. The Lhasa Apso is a small, well balanced, sturdy and heavily coated breed. It is rectangular in outline. 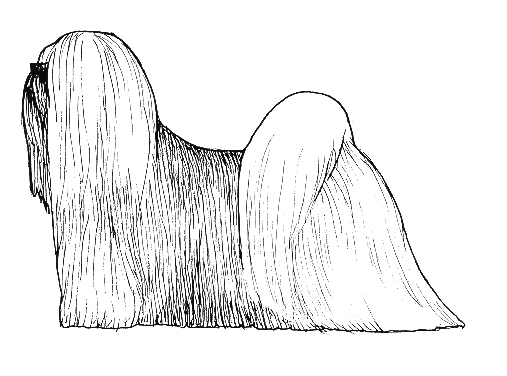 The Lhasa Apso is gay and assertive, but cautious of strangers. The narrow skull falls away behind the eyes. It is not flat, but on the other hand is not domed nor apple-shaped. It joins the muzzle at a moderate stop. The foreface is straight, but not square, and about 1½ inches in length. The length, measured from the tip of the nose to the eyes, is roughly about one-third of the total length of the head, measured from the nose to the back of the skull. The teeth must not show when the mouth is closed. A full complement of strong, white teeth meet in a level or slightly undershot bite. Dark in color, medium size, and forward placed in the skull. They are oval in shape, with no white showing. The pendant type ears are heavily feathered. The shoulders are well laid back. The forelegs are straight, and heavily furnished with hair. Longer than tall, yet well-balanced and compact. The topline is level, and the ribs extend well back in the body to a strong loin. Muscular and nicely angulated. Viewed from behind, the rear pasterns are parallel and not too close to one another. The round, cat-like feet have firm pads, and are well feathered. The well-feathered tail is high set and carried over the back. There may be a kink at the end. The heavy, very dense, hard topcoat is straight and of good length. There is moderate undercoat. The head furnishings are very heavy, with a good fall over the eyes, good whiskers and a beard. Legs, forequarters, hindquarters and neck are heavily furnished. Faults: Woolly coat. Silky coat. All colors are acceptable. Dark tips on the ears and beard may or may not be present. Heights are variable, but the desired height at the withers is about ten inches for males, with females being slightly smaller.